Wiona is imported in utero from Poland. 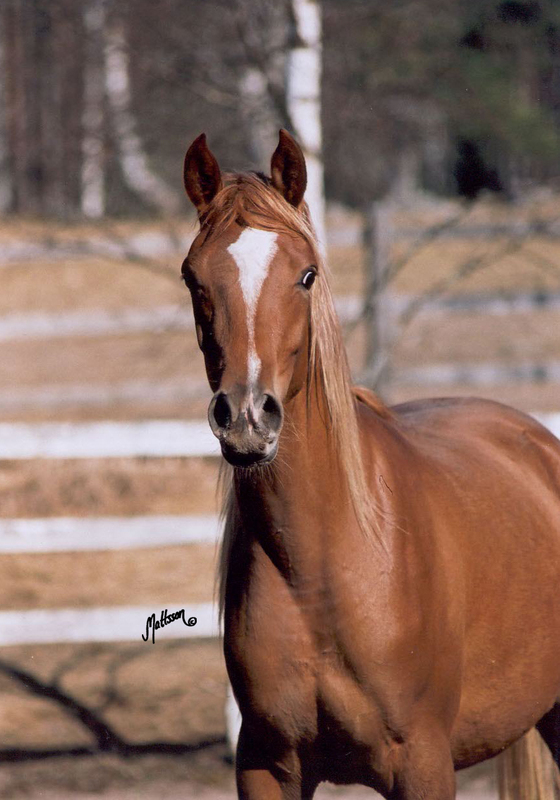 Her sire Angor was named 1999 and 2001 Polish National Reserve Champion Stallion. Angor is by the Probat-son Alegro, a son of the Queen of Janów Podlaski Algeria. Angor´s dam is the beautiful fleabitten mare Angola (Palas x Andria), Polish National Champion Mare and Masters Open Reserve Champion Mare. Angola was also the dam of Anegdota (Polish National and Junior Spring Show Champion Filly) and Antwerpia (Belgian National Champion Mare and the granddam of Polish National Champion Stallion Alert). Wionas dam is the exquisite Palas-daughter Warszula (Palas x Wacpanna), 1989 Polish National Reserve Champion Mare, 2002 Swedish National Champion Mare and 2002 Scandinavian Open Reserve Champion Mare. Warszulas damline traces down to the great mare Warmia (Comet-Wadera), the dam of Wizja (1977 US National Champion Mare) and Wilejka (the dam of Wojslaw). Warszula is also the dam of Wadim (by Grandorr), 1997 Swedish National Champion, 1998 All Nations Cup Reserve Champion Stallion in Aachen, 1998 Champion Stallion Vilhelmsborg, 1998 Reserve Europan Champion, 2000 UK International Champion Stallion. Warszula was sold to Kullatorp Arabian Stud in 2000, in foal to Angor. Unfortunately she only had Wiona before her untimely death in 2004.